Facilities - EVERYONE BELONGS. EVERYONE ACHIEVES. The Edison K8 School has a wide range of facilities that support its academic, athletic, and extra-curricular activities. The Edison K8 School currently has an arrangement with Boston College to use their grass playing fields during the school day when there are no conflicting activities. The summer 2011 schoolyard renovations will add a small multi-purpose, year-round artificial turf field (approximately 60 feet by 90 feet) for physical education classes, recess, and after school sports practices. The Edison K8 School has a cafeteria with two separate seating areas. Free breakfast is available for all students. In the morning, arriving students are directed downstairs to the cafeteria or to the auditorium. Students in grades 5-8 have breakfast in the classroom while students in grades K-4 eat breakfast in the cafeteria. When school buses arrive late, students are still given the opportunity to pick up breakfast before heading to their classroom. A hot school lunch is provided each day to all student free of charge. During students' lunch period (40-50 minutes) students will split the time between lunch and recess. While at recess students are encouraged to participate in safe play with a Playworks coach. Adult lunchroom monitors are present in the cafeteria during lunch time. The Edison thinks flexibly about classroom spaces. Our instructional spaces are designed based on the learners inside them. Throughout our building you will see flexible seating, sensory tools, and areas designed for small group instruction. Straight ahead as you walk in the front door of the Edison K8 School is the school's auditorium (first floor). 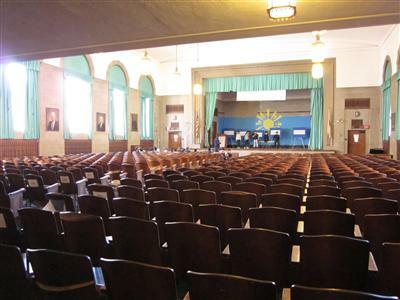 The auditorium is used for Friday morning school assemblies, school meetings (such as the "open house" each fall), and performances (such as the school's two annual dramatic productions). The balcony can be reached from the second floor. The Edison K8 School has an indoor gymnasium for year-round physical education classes and indoor sports. The gymnasium is located on the ground floor, next to the cafeteria (underneath the auditorium). The gymnasium has a full basketball court. During the school day the gymnasium is in near-constant use by the physical education classes. After school, the on-site after-school program has access to the gymnasium. Intra-mural basketball also uses the gymnasium after school. The Edison K8 School got an outdoor classroom as part of the a Summer 2011 schoolyard renovations project. The outdoor classroom is located on the western side of the school building, near to the flag pole. It contains space for two different classes to meet simultaneously, with seating on logs for the students. There are elevated growing tables and in-ground beds for planting. One side of the outdoor classroom has native woodland plantings; the other side has native meadow plantings. Both have paths through them so that students can explore the two different habitats. On the north end there is a storage shed with a green roof and a solar panel. The energy from the solar panel light the inside of the shed at night, which are visible as a glow from nearby Glenmont Road.